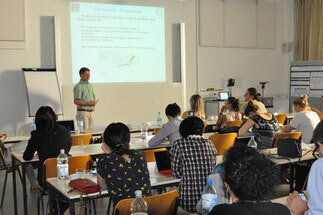 The summer School „Translational Research for Rare Diseases“ has been celebrated this year in Munich. This seminar was organised for the members of the Research for Rare Network – The network of the BMBF-funded research networks on rare diseases”, for members of the Else Kröner Fresenius Clinical Research School München “Rare diseases of the immune system – from pathophysiology to new therapies”, as well as for the members of our thematic network “Research for Rare Diseases and Personalized Medicine” (DAAD). Also other scientists who do not belong to the above mentioned networks could participate in this seminar upon request. Our DAAD partner and their fellows visited Munich from the 21st until the 23th of June. On the first day the partners and fellows of the thematic Network „Research for Rare Diseases and Personalised Medicine“ met for their annual internal meeting where the Network coordinator Prof. Christoph Klein gave an update of the network activities and numbers and presented the new partner who will be joining the network this year. After this meeting they had the chance to visit the laboratories at the Dr. von Hauner Children Hospital. 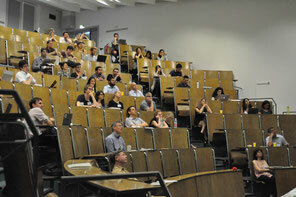 The joint Summer School was inaugurate from Professor Klein (Medical, scientific and ethical challenges with respect to translational research in rare diseases), Professor Winkler, Leader of the EURAT-Project group „Ethic and Patient orientation in the Oncology“ at the University Hospital in Heidelberg Heidelberg and Professor Reis, Director of the Institut for Human Genetics . All these lectures were acting as impulse to the newest investigations in genom sequencing development. The additional talks were given by elected participants and specialist of the particular areas of expertise. The junior scientist had the chance to the interdisciplinary exchange in the field of the rare diseases, as well as to present and debate their works. In the workshop “ethics and legal aspects of the genome sequencing” patient cases were presented and the participants discussed in a very open and controversial way. This seminar gave researchers the opportunity to discuss their results in an international and interdisciplinary group. Main Topics were in the field of innovative genetics, translational research and research ethics. Throught the participation of our DAAD Partner and their fellows from different countries (Iran, Israel, Canada, Thailand and Turkey) the event had a very international character and gave the chance to an intercultural exchange in the field, which was very welcome. The seminar was complemented by a workshop on proposal writing, which could be chosen in addition to the thematic part. All participants follow the sessions of this seminar in a very enthusiastic way and also if the very high temperatures made the room very hot, the participants kept very concentrated. We received very positive feedback from the seminar and the participants evaluated it as a very interesting and high level seminar.